There's a radio button All. There are multiple checkboxes, one for each value. It's possible to select all items – by selecting all checkboxes or by using the All option. It's possible to deselect all values, which is the same as selecting all values. This means, there's never an empty selection. I've created a small prototype where you can see it in action and try it yourself on jsfiddle.net. I kind of like this concept but I'm not really sure about it. We like to use it together with a short list of 4-8 items where it's mandatory that one, multiple or all items are selected. Is it a good way to represent this kind of selection? *Unfortunately I can't recall where we have seen this. Hmm, I'm finding your prototype quite confusing to use. I find it very confusing that, after selecting all the values, it automatically deselects them and selects the "All" button at the top. Also, the "All" button is not really a radio button as there's only one choice. Normally radio buttons have 2 buttons or more. If you need people to select either a) all or b) at least one then I would use a validation message to enforce that. Use checkboxes for all choices, INCLUDING, the ALL choice. Place ALL as the first option. 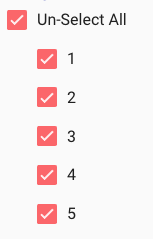 If ALL is clicked, mark all the options as checked (including ALL). Display the ALL choice like the other choices. No indenting required. You can display an incomplete selection for ALL if you want to remind (nudge) the user towards this option. you're mangling different input types for the same action: select. Keep the inputs consistent to avoid confusing the user. In your example the select all state (selected radio) results in 3 unselected states (unselected checkboxes). This confused me greatly and would others. Use the example as suggested by Andrew, above. You need to use all items with checkboxes. You can also change top checkbox's label whether it's selected/unselected with a counter. Not the answer you're looking for? Browse other questions tagged usability forms selection multi-selection or ask your own question.